The College of Business and Economics (COBE) prepares students for leadership in organizations serving Hawaiʻi and the Asia/Pacific region. The College offers undergraduate degrees in Accounting and Business Administration. Students can major in Accounting or General Business. Accounting majors take a series of accounting core and elective courses to compliment the business core courses. Students choosing General Business may choose electives to specialize in economics, finance, health care management, marketing, or management. Tourism, economics, and information systems electives compliment the Business Administration degree. Students receive a strong managerial foundation in business enterprise functions and objectives, supported by a strong liberal arts foundation. Our mission is to offer business education rooted in the liberal arts tradition. We provide a foundation for students to become confident, competent and ethical business leaders. We achieve this goal through active pedagogy, internships, community outreach and scholarship. The College employs a variety of instructional methods and provides opportunities to apply new instructional technologies. Small- and medium-size lecture classes allow for maximum student-instructor discourse. Core and elective classes feature group project work to encourage teamwork and applied learning experiences in problem solving and/or community service settings. Independent study allows students to study a particular area of interest under an instructor’s supervision, often relating to research of mutual interest. 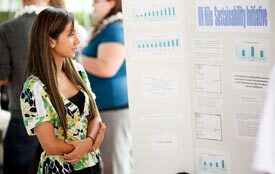 Internships allow students to apply knowledge and techniques from the classroom and to pursue individualized learning goals in an operating business environment. A unique feature of COBE includes a partnership with the Hawaiʻi Small Business Development Center Network, providing students with access to special business expertise and learning experiences. Business programs in the College of Business and Economics are accredited by AACSB International—The Association to Advance Collegiate Schools of Business. Contact information: 777 South Harbor Island Blvd., Suite 750, Tampa, FL 33602-5730; Tel: (813) 769-6500; Fax: (813) 769-6559; www.aacsb.edu. Students may transfer credits to other American or foreign universities on the same basis as course credits are transferred by other accredited American universities. Accreditation documents relating to the University of Hawaiʻi at Hilo are available to the public at the Edwin H. Mookini Library and on the Accreditation website. A COBE Student presenting a project. Last updated on Thursday, March 29, 2018, 1:07pm HST.